When an entire town is named a UNESCO World Heritage Site, you know it's going to be an interesting place, and that is the reason we chose to make an overnight stop in Évora on our trip through Portugal last summer. Medieval city walls, an ancient Roman temple, a 16th century aqueduct, a Gothic cathedral, and even more fascinating history await visitors to this town located about an hour and a half drive from Lisbon. After a little bit of a glitch with our accommodations but then finally checking into a lovely hotel, we realized we were just around the corner from the remains of Temple Diana, Évora's most famous landmark. This Roman temple survived the ages since its construction around the first century A.D. because it was put to various uses since the Middle Ages and regularly restored. It is considered one of the best preserved Roman ruins on the Iberian peninsula. View of Temple Diana from the Évora Cathedral. Besides the Romans, the Moors left their mark on Évora as well. The city was under Moorish rule for over 400 years. 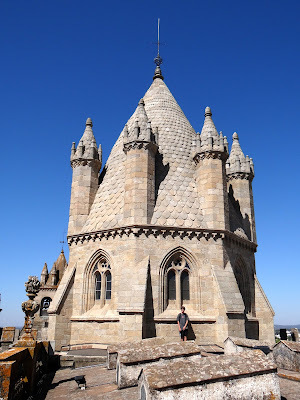 Being the avid steeple climbers that we are, we gladly paid the 13€ for four of us to climb the Évora Cathedral tower up to the roof. The views over the town are magnificent, as the church was built on the highest point in the city. The cathedral, a blend of Romanesque and Gothic style architecture, was built in 1186. It is believed that the flags of Vasco da Gama's first ships to the Orient were blessed here. Very unique to the Évora Cathedral is the very pretty lantern tower over the crossing with its picturesque windows and six little turrets surrounding the spire. The central square in town is Praça do Giraldo and it's a nice place to stop for a cool drink or bite to eat. We had dinner at Café Arcada, which has a large diner sort of feel, and their menu pleased everyone in our family. Praça do Giraldo is Évora's central square. Before you leave town be sure to browse the shopping alleys. Beautiful items crafted from local cork are great souvenirs. On your way out of town, you can visit the Aqueduct of Silver Water which stretches for 6 miles and was built in the 1530s to deliver water to the city of Évora. You can drive right through the aqueduct's arches. I just admire that first photo, and it's something I've been seeing around lately. Even on my recent trip to Michigan, what a wonderful way to brighten the world, and a wall and show off beautiful flowers too. What a lovely post images and all, thanks. The pictures look wonderful. I thought the heritage site is only for great landmark of the city so I guess it is pretty cool that the entire town is named a UNESCO World Heritage Site. It is nice to see that the Portugal has preserved their medieval architectures and Gothic cathedrals. Beautiful photos! The views from the top of the cathedral are amazing - I always have trouble climbing those narrow, winding staircases though! Beautiful places. I should visit this place to experience the beauty. Love your photos, Sonja. I had no idea there were Roman ruins in Portugal. Putting a kid in the picture sure helps your readers get a sense of scale:) That lantern spire is much larger than it appeared at first glance. Gorgeous! I have been wanting to visit Evora. I went to Portugal for my first trip last spring and it was lovely (but to Porto and surround area). I love visiting UNESCO towns, they are definitely interesting to see. Great historical remarks. Awesome architecture. I love the view from the top of the catherdral. Thanks for the nice read. I’m getting “Reise Fieber” as they say in German, just watching the gorgeous pictures … such a beautiful world !